Ancient Egypt is always a popular theme when it comes to casino games. For years both land based and online casinos have prided themselves on having at least one, and sometimes many, Egyptian themed, gold laden slot game with which to entice gamers to win big money. Whether it is the allure of all that Egyptian gold, or the sexiness of Pharaoh design that lures in the gamers isn't clear. 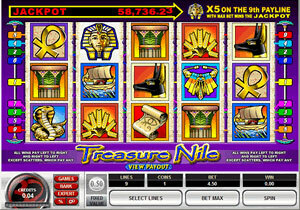 s.
Treasure Nile generally features 5 reels, with gamers able to select up to 9 different possible pay lines with with to try and snag a big progressive jackpot. The overall look of the bars in Treasure Nile makes it visually appealing, as well as enjoyable. Hieroglyphs, accessories, snakes and Pharaoh symbols adorn the bars, and the game as a whole, providing the gamer with a rich visual experience as well as enjoyable fun, and a multitude of ways to win. When it comes to winning, the aim is of course to match up as many of the same symbols as possible. You'll receive a far greater prize for the more Scarab beetles (scatter cards) you can successfully line up, for instance. The use of the Scarab scatter cards pays handsomely even if you don't have anything else to go for! Obviously the best symbol to have would be the Pharaoh symbol, as nothing can be a finer more obvious sign of Ancient Egypt's glory than it's God-like head of state. Collecting five such Pharaoh's will result in you picking up the progressive jackpot. Not too shabby at all, for an easy day's work. But keep in mind, this is only the case if you have all 9 pay lines activated! Collecting a Pyramid is no bad thing either. Pyramids are wild symbols in Treasure Nile, and finding yourself with such an icon means it may be substituted for any other symbol on the reel that you may need to win. As for the jackpots themselves; every time a gamer wagers a bet, a small fraction of that bet is incorporated into the progressive jackpot, which rapidly builds up to hundreds of thousands of pounds. With the maximum bet that a gamer can place being 4.5 credits for all nine pay lines, the price for entry into the massive progressive jackpot is quite cheap. Of course there is always a chance that you could fail and end up in the Mummy's Tomb, but who knows, perhaps your destiny does lie, in the glory of Egypt after all. It could just be possible that the life saving Nile, has something to offer you this year! All materials here © 1998 – 2013 SlotsJackpots.org – all rights reserved.